Description of "The children of the mother"
This e book presents the facts and research behind the show "Zara Hizaab Uthao: The His-story of women" at Lalit Kala Academy New Delhi, which was a huge success, and is now is to be shown at University of Illionois, Chicago. The artist who created the show, Sujata Tibrewala, was born in Jaipur Rajasthan, the Pink City of India. Sujata inherits her love for art from her maternal grandmother. Her grandmother loved to keep herself occupied with “creative works of the hand." Although she trained as an Image Processing expert, and worked as network engineer, her toddler daughter’s experiments with the paints and her husband’s literary interests instilled a new spirit in her as an artist.She gave up her career in 2008 for her first love art, and has had several successful exhibitions, gallery representations and workshops at various venues all over India and now also in the USA.. She now uses her engineering background and knowledge of science to spread art and issues close to her heart. To know more about her and her work go to: www.pratibimba.in, or email her at sujata@pratibimba.in. 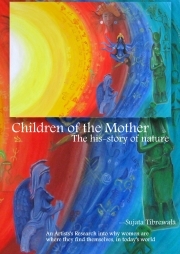 Reviews of "The children of the mother"